(Phys.org) —When a massive star exhausts its fuel, it collapses under its own gravity and produces a black hole, an object so dense that not even light can escape its gravitational grip. 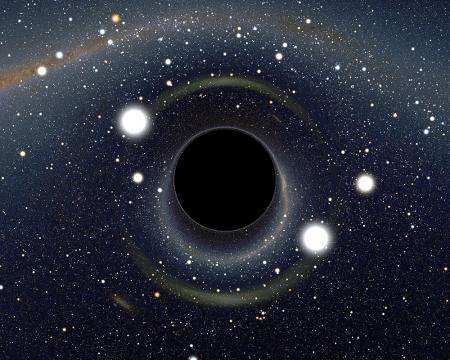 According to a new analysis by an astrophysicist at the California Institute of Technology (Caltech), just before the black hole forms, the dying star may generate a distinct burst of light that will allow astronomers to witness the birth of a new black hole for the first time. Tony Piro, a postdoctoral scholar at Caltech, describes this signature light burst in a paper published in the May 1 issue of the Astrophysical Journal Letters. While some dying stars that result in black holes explode as gamma-ray bursts, which are among the most energetic phenomena in the universe, those cases are rare, requiring exotic circumstances, Piro explains. "We don't think most run-of-the-mill black holes are created that way." In most cases, according to one hypothesis, a dying star produces a black hole without a bang or a flash: the star would seemingly vanish from the sky—an event dubbed an unnova. "You don't see a burst," he says. "You see a disappearance." But, Piro hypothesizes, that may not be the case. "Maybe they're not as boring as we thought," he says. According to well-established theory, when a massive star dies, its core collapses under its own weight. As it collapses, the protons and electrons that make up the core merge and produce neutrons. For a few seconds—before it ultimately collapses into a black hole—the core becomes an extremely dense object called a neutron star, which is as dense as the sun would be if squeezed into a sphere with a radius of about 10 kilometers (roughly 6 miles). This collapsing process also creates neutrinos, which are particles that zip through almost all matter at nearly the speed of light. As the neutrinos stream out from the core, they carry away a lot of energy—representing about a tenth of the sun's mass (since energy and mass are equivalent, per E = mc2). According to a little-known paper written in 1980 by Dmitry Nadezhin of the Alikhanov Institute for Theoretical and Experimental Physics in Russia, this rapid loss of mass means that the gravitational strength of the dying star's core would abruptly drop. When that happens, the outer gaseous layers—mainly hydrogen—still surrounding the core would rush outward, generating a shock wave that would hurtle through the outer layers at about 1,000 kilometers per second (more than 2 million miles per hour). Using computer simulations, two astronomers at UC Santa Cruz, Elizabeth Lovegrove and Stan Woosley, recently found that when the shock wave strikes the outer surface of the gaseous layers, it would heat the gas at the surface, producing a glow that would shine for about a year—a potentially promising signal of a black-hole birth. Although about a million times brighter than the sun, this glow would be relatively dim compared to other stars. "It would be hard to see, even in galaxies that are relatively close to us," says Piro. But now Piro says he has found a more promising signal. In his new study, he examines in more detail what might happen at the moment when the shock wave hits the star's surface, and he calculates that the impact itself would make a flash 10 to 100 times brighter than the glow predicted by Lovegrove and Woosley. "That flash is going to be very bright, and it gives us the best chance for actually observing that this event occurred," Piro explains. "This is what you really want to look for." Such a flash would be dim compared to exploding stars called supernovae, for example, but it would be luminous enough to be detectable in nearby galaxies, he says. The flash, which would shine for 3 to 10 days before fading, would be very bright in optical wavelengths—and at its very brightest in ultraviolet wavelengths. Piro estimates that astronomers should be able to see one of these events per year on average. Surveys that watch the skies for flashes of light like supernovae—surveys such as the Palomar Transient Factory (PTF), led by Caltech—are well suited to discover these unique events, he says. The intermediate Palomar Transient Factory (iPTF), which improves on the PTF and just began surveying in February, may be able to find a couple of these events per year. Neither survey has observed any black-hole flashes as of yet, says Piro, but that does not rule out their existence. "Eventually we're going to start getting worried if we don't find these things." But for now, he says, his expectations are perfectly sound. With Piro's analysis in hand, astronomers should be able to design and fine-tune additional surveys to maximize their chances of witnessing a black-hole birth in the near future. In 2015, the next generation of PTF, called the Zwicky Transient Facility (ZTF), is slated to begin; it will be even more sensitive, improving by several times the chances of finding those flashes. "Caltech is therefore really well-positioned to look for transient events like this," Piro says. Within the next decade, the Large Synoptic Survey Telescope (LSST) will begin a massive survey of the entire night sky. "If LSST isn't regularly seeing these kinds of events, then that's going to tell us that maybe there's something wrong with this picture, or that black-hole formation is much rarer than we thought," he says. More information: The Astrophysical Journal Letters paper is titled "Taking the 'un' out of unnovae." A full mind will not learn, set aside your faith for a moment and read if only a sentence or two from a small abstract, that may, if given the chance, open your mind to new possibilities. We live in a time where truth becomes myth as our technology allows us to see what was unseen. Big bang is a creation story and black holes are its angels. Only faith and the million dollar industries it spawned keep it alive. Most of our old theory began before we had instruments to measure and image from the radio wave to the gamma ray. Plasma cosmology is here to stay with over a hundred years of laboratory experiments. No need for a black hole center with a plasmoid in its place, and throw out your dead dark matter with it... Gravity is not the only game in town! No need for a black hole center with a plasmoid in its place ..
We are seeing a black hole being born when there's a supernova. How is this method better? Go ahead and describe the rotation and orbital motion of stars in galaxies based on the same theories, and do it without inventing hypothetical dark matter. BTW, electrodynamic interactions of charged bodies can describe all those orbits just fine. In addition to that, inventing new physics or matter IS NOT required to explain any behavior or morphology of any galactic system whatsoever by using the properties of electrodynamically interacting plasmas. But if you're okay with inventing, out of thin hot gas, 3-4 times more matter than what is observable to save your pet theory, then you go ahead and BELIEVE what you choose to believe. We need more ultraviolet telescopes in space to detect this sort of thing. I suspect that it will be a bit like a solar flare, with the brightest time being only hours rather than a day. After this though the black hole is going to eat away the star from the inside, I would be surprised if it lasted a year! Go ahead and describe the rotation and orbital motion of stars in galaxies based on the same theories, and do it without inventing hypothetical dark matter. Cold, non-baryonic dark matter is required for nucleogenesis, for the early structure of cluster distributions, to explain the upper cutoff of the Harrison-Zel'dovich spectrum, and many other observations so there is no doubt whatsoever that it exists. Measure it with gravitational lensing and the velocity rotation curves are as expected. BTW, electrodynamic interactions of charged bodies can describe all those orbits just fine. Then do so, show me the paper or your calculations. Not only does it turn out we are anthropic enough to find ourselves in the perfect universe, orbiting the perfect sun, on the perfect planet for intelligent life -- not only that, but also we find we can analyze events that a neutral observer might find utterly implausible, at absurdly large distances... and we keep getting consistent answers. Here's my theory: obviously the data is fake! A place this cool, and it is ours? C'mon. All this "figuring out the universe" activity we've been engaging in for thousands of years is probably a big test by whoever is really in charge, to see if we can get the answers. So, what do we get if we pass? Because I THINK WE HAVE PASSED. We now seem to know more about ourselves and what surrounds us than is remotely plausible for simple, bipedal hominids like ourselves to have figured out. You know I'm right. I know I'm right. It's time for us to reach the next level of this game. Hear us, system manager... WE ARE WAITING. ROFL, your crank papers try to explain an inverse square force which was long ago falsified. We know it exists because all the unconnected observations are consistent with a single model. If these were disparate errors, they wouldn't all be solved by dark matter with the same characteristics. Only in the minds of relativists who still believe space plasma can be treated with gas laws. Or those who note that Mercury's orbit cannot be described by the inverse square law, that the banding of starlight is exactly the GR value and double that predicted by the inverse square law, that binary systems with pulsars lose orbital energy at the rate predicted by GR due to gravitational radiation, that objects in orbit experience a torque matching the Lense-Thirring effect, etc.. It was a simple thing to ask, read the abstract...Since you obviously did not, here is one sentence. "It is possible to simulate the production of spiral galaxies and barred spirals."